The bright red canna lilies growing alongside my house attract hummingbirds from the first bloom in late spring to the last one drops off in September. Those hungry hummingbirds belly up to the flower buffet arranged by hundreds of tiny trumpet-shaped flowers perfect for collecting sweet nectar. Feeding hummingbirds by hand at the Zaleski State Forest. Photo by Kathy Petrucci. The flowers grow an impressive six and a half feet tall, meaning that the top blooms are visible when I stand at the kitchen sink. The canna lily is a collection of flowers on each wand, offering dozens of tiny feeding spots in a small space. 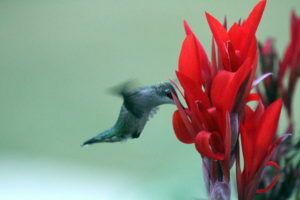 Hummingbirds love feeding from them, moving from one wand of flowers to the next. These flowers are a gorgeous red. Maybe that color attracts the hummingbirds, maybe not. While I grew up thinking red was a color that attracted them, the rangers at Zaleski State Forest’s Hummingbird station told us color didn’t matter. 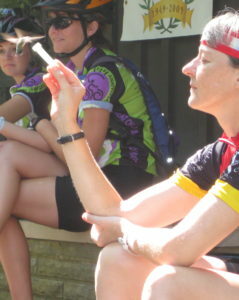 That’s the one and only time I had the delight of hand-feeding a hummingbird. The first spring in this house, as I stood at the kitchen sink rinsing a cup, I caught a glimpse of fluttering wings, a flash of a bird about the size of a sparrow. It moved way faster than that bird before it vanished below my sightline. My hopes soared. Please, please, please be a hummingbird. Don’t. Move. Xanth, stop meowing. Mommy is not giving you your treat just yet. But let me step back in time so you understand my delight. I grew up with my mom and dad’s hummingbird feeder, my nosed plastered to the picture window any time one of these acrobatic birds flew up. C’mon, they hover. They fly backwards. They fly straight up and drop straight down. That’s a bird acrobat if ever there was one. Then, for twelve years in the first house, I saw a hummingbird just a few times because I didn’t have flowers that attracted them. My heart skipped a beat every time, wishing that the places I had windows to look out, I had the right conditions for the dozens of flowers they love. I’d tried, three years running, growing cardinal flower, but it refused to survive. So here I was, my first spring in a new home, my heart beating wildly from that almost sighting. I stood stock still, silently cursing the cat’s insistence I feed him. It was my fault, really. I’d been washing off his plate from the night before to give him his treat, and I’d rudely stopped mid-action. Ruby-throated hummingbird wings average around 53 beats per second. You can see the hint of the figure-eight movement. I stayed motionless. Up the bird came, another flutter of wings, and then down just as quickly. Out of dozens of potential meals, the bird selected specific flowers to visit. The next time she disappeared downwards, I stood on my tip-toes and leaned over the sink as close to the window as I could get. A female ruby-throated hummingbird hovered below me. Then, without warning, she zoomed towards the forest, out of my sight line. Another night, around five pm, I sighted another hungry hummingbird, wings a blur at their beating rate of an unbelievable 53 times per second. It’s the crazy figure-eight pattern the wings move, along with the speed, that gives the hummingbird its ability to hover in place to dip its long beak into trumpet-shaped flowers. This female made fast work, and then she was off. Each day and time I spotted the hummingbird, I scratched down a note about the visiting time. Sometimes I’d be washing dishes; other times I was refilling the cats’ water bowls. Zoom, there went a hummingbird, fluttering from one flower to the next. Sometimes I could look directly at the bird, and it would continue to feed, while other times that meant an abrupt end to the visit. Day by day, I found the feeding patterns. I’d drop what I was doing and race to the window at 7 am, 5:15 pm, 8 pm, you name it. If I was working in the yard, I’d pack up fast and move behind a tree, around the corner, anything to keep from interrupting the bird’s feeding schedule. The logical progression was to try to capture the moment. 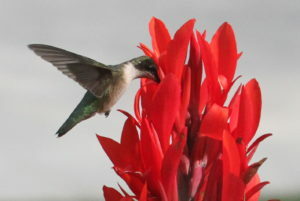 In two years of picking spots during their favorite feeding times, I tried every position, every camouflage I could think of—sitting on the kitchen counter, leaning into the kitchen sink, sitting in between the pine trees, you name it—but the hummingbirds elusively evaded decent pictures. Fading daylight, distortion from shooting through glass, fast movement on the bird’s part, an unsteadily held camera on my part, every one of them meant lackluster photos. A bright sunny day, an angle leading to my neighbor’s white concrete drive, a fast shutter speed, and the beautiful bird flitted into view while I was sitting on the countertop, my camera lens balanced on my knee. She hovered, taking more time in each flowerhead than I swear she, or others, had done on previous visits. I shot in rapid fire, trying to pan with her. Finally, I had photos to cherish. Her little tongue stuck out, right before she dove into the flower. Side views. Front views. In focus! Now it’s fall. The male hummingbirds have already begun their migration. Some leave in early August. Females are on their way now. 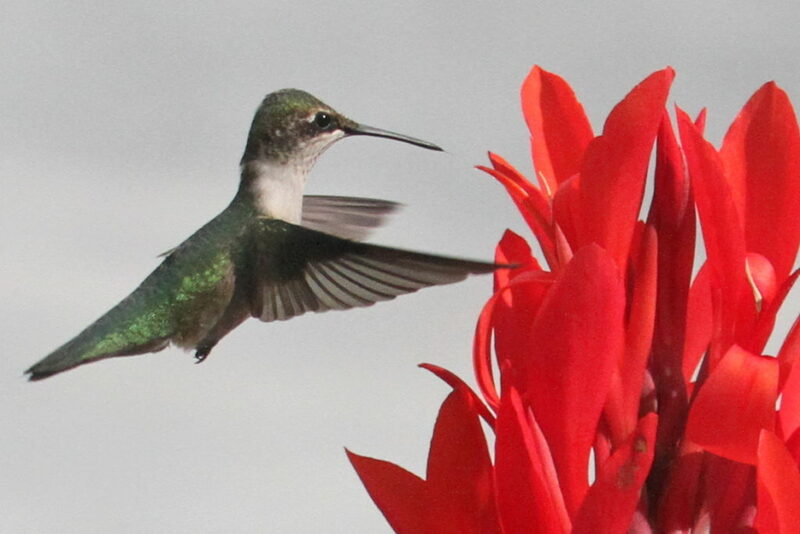 Through October, hummingbirds visit Central Ohio enroute to Central America. They take advantage of my last blooming canna lilies, and then I won’t see them again until the first blooms open next year. Diehard birders track their sightings. Notice how the wing closest to you seems to disappear? That’s because of the hummingbird’s figure-eight pattern and the speed versus the slower shutterspeed. As fall deepens, fewer canna lily flowers remain. I hope you’ll have this same opportunity, thrilling to the acrobatics of a hummingbird drinking nectar. Check out hummingbird pages to learn all about them. If you live in Ohio, check out the native plants you could grow. Native plants like wild columbine and cardinal flower establish better, and without the efforts you’ll have to invest with non-native plants and annuals. If you don’t mind the extra work, don’t have an outdoor cat, and like the pop of color from those annuals, plant snapdragon, zinnia, petunia, or impatiens. Even day lilies work; but for canna lilies, unless you’re lucky like me and your furnace exhaust keeps them warm all winter, you’ll need to dig them up every year to over-winter them. If hummingbirds do visit you, what’s your favorite story about them? Share it! This entry was posted in Animals, Birds, Uncategorized and tagged attracting hummingbirds, feeding hummingbirds, nectar, ruby-throated hummingbirds. Bookmark the permalink. I am lucky. 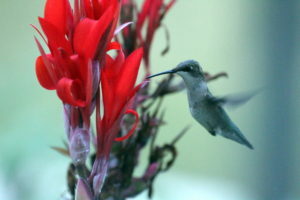 Arizona is a great spot for hummingbirds year round. I mostly see Anna’s, but have also seen Costa’s and broadbills. Oooh, what fun to have that variety! I’m glad you get to see them.